Mother’s Day Macarons! What a lovely idea. Something very special from your heart and the heart of your kitchen. How they got to be such a huge craze, I don’t know. I can tell you how it all started for me. It was my 11-year-old niece, Julia, who came running into my kitchen with her “Beginner’s Macaron Kit.” Of course, my first reaction was to be the kind of auntie that I had always wanted as a little girl, with that “yes, we can do anything together and have fun” kind of spirit. My second reaction was sheer panic. Um… macarons? As in French Macaroons? As in extremely-tricky, most-people-fail-at-first macarons? But you should never let ’em see you sweat – and this would be a great time to put that philosophy into practice. Could I really let Julia down? The little gal that wears an apron embroidered with the phrase “What Would Julia Do?” Well, what would Julia do? After reviewing Julia Child’s macaron recipe, I decided to hunt for a simpler version, and I found it. So here’s the big picture: there are only five ingredients to French Macaroons, so that’s not the challenge – it’s the technique that’s a bit tricky. But it’s worth the effort. Especially for Mom and Julia. In a food processor, combine almond flour and powdered sugar and blend to obtain a fine powder. Sift into a bowl. Repeat sifting. In a mixing bowl with an electric beater, whisk egg whites until foamy (about 1 minute). Add a pinch of cream of tartar and salt. Whisk until meringue begins to thicken. Slowly add fine granulated sugar, a little at a time. Whisk on high until egg whites have the texture of shaving foam with soft peaks. Add sifted almond mixture to the egg whites. Using a silicon or plastic spatula, gently fold the mixture until the almond powder and egg whites are fully incorporated. Mixture is done when it is smooth, shiny, and slightly runny (like a cake batter). Do not mix beyond this point. If using a coloring or flavor, it must be added at this point. Place the mixture in a piping bag with about a ¼" tip. Pipe about a nickel-size of the mixture on a baking sheet lined with parchment paper or silicone pad, about 1 inch apart. Important: set baking sheet on the counter for about 30 minutes at room temperature until a slight crust develops over the macarons. Bake at 325ºF (use standard bake element, not convection) for about 15 minutes. 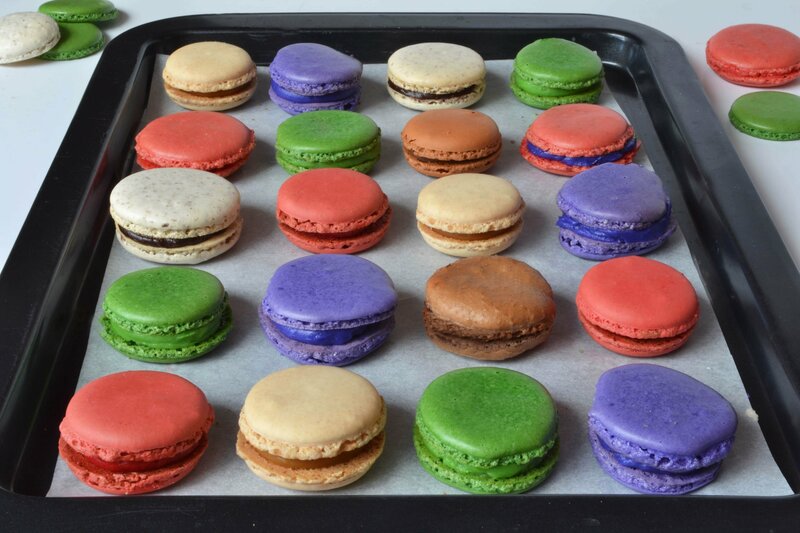 Allow the baking sheets to cool and the macarons to harden before lifting them away from the baking sheet. When cool, fill with icing of your choice, like butter cream icing or ganache.